On a cloudy Friday afternoon, a handful of students were scattered across the second-floor classroom of SMAN7 Bandar Lampung. Heads down, these 10th and 11th graders were busy scribbling away. In spite of the distant roar of thunder and the loud, commanding shouts of marching leaders from the school’s courtyard, the students were focused on the task at hand. Focused, because unlike the other writing activities they’ve previously had, this one hits particularly close to home. For the last English Club session this semester, I opted to skip the more lighthearted Thanksgiving themed-activities like drawing hand turkeys for a more serious writing activity. I challenged the students to compose a letter with no outside help. No phones, no Google Translate, and no concern about perfect grammar. Just pen, paper, and their thoughts. Their prompt: to write to someone in the U.S. who knows nothing about Islam. On one hand, I wanted to encourage students to use their English writing skills without getting too bogged down by the formalities of the language. I wanted the process to be natural—to be personal. On the other, I saw this activity as a unique opportunity to broadcast the voices of Indonesian youth to a wide audience. I thought that this would be pertinent, especially in the wake of the recent incidents in places like Lebanon, France, and Iraq, as well as the subsequent Islamophobic attacks on Muslim communities all over the world, including in the U.S. The weeks after the ISIS attacks and bombings occurred, my Facebook newsfeed was flooded with news of governors refusing to accept Syrian refuges, protests and vandalism on mosques, as well as hate crimes against Muslims. I also saw articles, statuses and comments denouncing Islam and Muslims; their rhetoric, harsh and hateful. I have never felt comfortable calling people out on social media, especially when it came to issues on Islam. As a Filipino-American who was raised Catholic, I cannot represent the voices and sentiments of Muslims from around the world. Nor do I have the capacity as a writer to compose an entire article in response to Islamophobia, like this current ETA’s post. And so, constantly finding myself at a loss for words, I decided to recruit the help of my students. Where I cannot dismantle the harmful Islamophobic stereotypes that circulate the globe and the Internet, my students—who come from the country with the world’s largest Muslim population—can represent the diversity and beauty of Islam. I could share links to articles explaining the philosophies of Islam or how ISIS does not reflect Islamic values, but my role as an ETA in Indonesia grants me the unique ability to pass the mic onto Muslim youth. While I cannot speak for Muslims, their personal anecdotes can. By the end of the session, each of the students read their letters out loud. Each letter, a poignant message to an imaginary friend from across the globe whose only view of Islam is colored by Western mass media. With the students’ permission, I created a patchwork letter—one cohesive collage, stitched together from excerpts of students’ individual letters. Here are their words, with no grammatical corrections, to provide you with authentic voices that are not usually shared on Facebook or broadcasted on Western media. You can call me K. I have an awesome family…I am 15 years old. My religion is Islam. I have one sister…I love watching anime, reading manga, or playing games. And I love rock music because my Dad loves it too. Me and my Dad have so many things in common…My hobby is playing basketball and listening music. And then, my favorite colour is red. My favorite music is electro and rap. My favorite food is rendang…I love sharing my thoughts with my best friends. We could talk about it like a whole day…When I go somewhere on holiday, I never forget to bring my camera, because I like to take picture of interesting place or something. I want to be a doctor…My dreams is to be someone who can make my parents proud of me. I wanna work in a big factory or a bank as a manager, maybe? lol. I have so many dreams that I can’t tell. Do you guys know what Islam is? Islam is one of religions in this world which is teaches us to loving each other and be a useful person…Islam teach we must love everyone who have different religion, because we are brother and sister. Islam teach we must help who need a help, we always giving…Islam teach us to read Al-Qur’an. Al-Qur’an have many ways to break your problems, teach you how to life on peace, tell you about some story of our prophet…What I think about Islam is beautiful. Why? Because Islam teach us to love each other, to give each other, to help each…Islam is not terrorists. The fact, Islam is appreciate different of people in the world. Islam not dangerous. Islam like peace in the world. About ISIS, I think ISIS is bad people. They kill who not follow their rules. They said they follow the rules of Islam but in fact, it’s not true. Islam never force people want to be Muslim or not, but ISIS force of anything. ISIS is like terrorist…I think ISIS is not a part of Islam because ISIS teach about Islam in a wrong way. Islam not teach us to be a terrorist, to kill other person. ISIS is radical, rude, and selfish. They want to make the world afraid of them…I think ISIS is a bad organization because they broke the peace of the world. They also broke the relationship between Muslims and another religions. They made people think Muslims are bad people but actually they are good people…ISIS is just a freakin selfish and the meanest organization on this planet. They’re called their self a Muslim but they forced anyone to follow their rules which is the wrong rules in Islam…Many people think Islam is ISIS or a terrorists. But I’m not like that. I think what ISIS do is wrong. Don’t hate Muslim. Don’t think all of Muslim are terrorist. No, we aren’t terrorist. We’re not killer. And we are brother and sister…Actually, I feel uncomfortable. Because, many people think that Muslim is a terrorist. I love to play a video game and listen a music, but I always take a pray when it time to take a pray…I want you to not afraid of Islam because we are not dangerous. Don’t think we are want to kill you…Have you ever heard about Zayn Malik? Is he a bad guy? Is he a terrorist? His friends are Christians, and he appreciates them. So what’s the matter? Are you still afraid of Muslims? You won’t know if you don’t try! Let’s try to make friend with Muslims and prove it by yourself. I’m ready to be your friend. Ramon Caleon with the students of SMAN7 Bandar Lampung’s English Club. 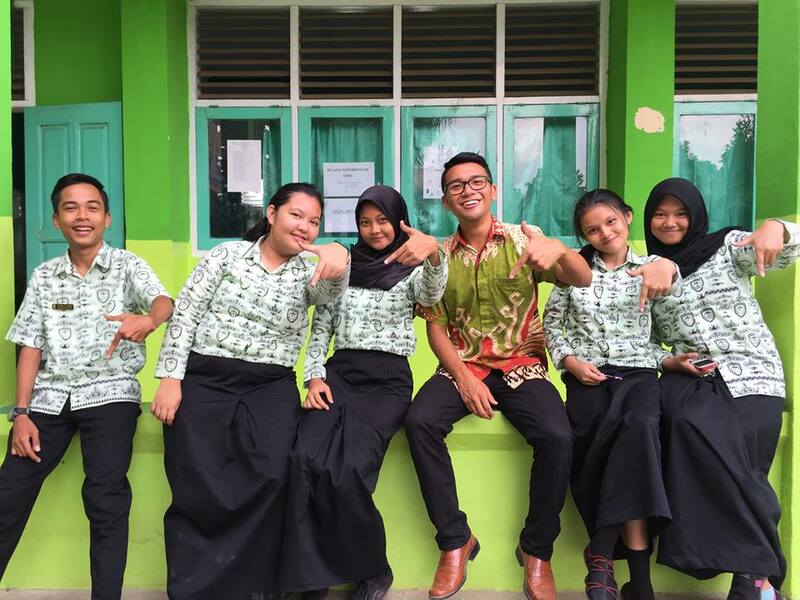 Ramon Caleon is a Fulbright Teaching Assistant placed in Bandar Lampung, Lampung at SMAN 7. He graduated from Pomona College in 2015, where he studied Biology. He enjoys playing Bananagrams with students, jumping off of boats, and remembering to breathe. Hu mr ramon iam so sad ..